Yosemite National Park is Mammoth's closest Neighbor that embraces a spectacular tract of mountain-and-valley scenery in the Sierra Nevada. Mammoth and Yosemite share the same mountains and the entrance to the park is just 45 minutes or less north of Mammoth. It makes a perfect day trip for families who are vacation in Mammoth Lakes. Yosemite was set aside as a national park in 1890 so it was around when Mammoth was flourishing as a gold mining town. The park harbors a grand collection of waterfalls, meadows, and forests that include groves of giant sequoias, the world's largest living things. There are numerous Yosemite hikes and trails, so many you may wish to stay a little longer in Mammoth so you can take advantage of this spectacular area. Tioga Road and Tuolumne Meadows is a favorite day trip for Mammoth vacationers. Its eastern entrance at Tioga Pass is just 45-minutes from Mammoth. Tioga Pass is typically closed due to snow from mid-November through May. You can easily check that with one of the ranger station or visitor centers before heading out. The inspiring scenery in Yosemite is overwhelming with tremendous mountain peaks, a series of gigantic granite domes, lakes and glistening waterfalls. It offers a 39 mile scenic drive between Crane Flat and Tuolumne Meadows through forests and past meadows, lakes, and granite domes. Many turnouts offer broad and beautiful vistas. Tuolumne Meadows is a large, open sub-alpine meadow graced by the winding Tuolumne River. From sometime in November through late May or early June, this area is only accessible by cross-country skis or snowshoes. Yosemite Valley is approximately 70 miles, one way from Tioga Pass. Take U.S. 395 North from Mammoth Lakes about 30 miles to Hwy. 120 West. Turn left and wind your way up Lee Vining Canyon to Tioga Pass (10,000 ft.), the eastern entrance to Yosemite National Park. Watch for bighorn sheep on the rocky cliffs above Tioga Pass as you drive. Receive a free Park map with your entrance fee and follow Hwy. 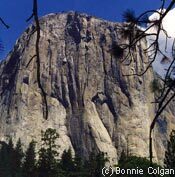 120 through the magnificent Yosemite high country, past the immense granite domes of Tuolumne Meadows and scenic Tenaya Lake. Be sure to take advantage of the breathtaking views of Olmstead Point Overlook as you descend the western slope of the Sierra Nevada. There are so many hikes and place to see in Yosemite that you may want to grab a hotel in Mammoth if you plan to say overnight.